The days from 1964 to 1968 were the busiest of my life. I was responsible for many lab workshops in Saigon University. I was also a full-time student in the Bachelor of Buddhist Studies Program at Van Hanh Buddhist University and President of the Student Union there, organizing the book publishing, special seminars, and a group of students who collected food, clothing, and cooking utensils to send to the poor people of Quang Nam and surrounding areas. I was head of the Extension Department of the School of Youth for Social Service, coordinating volunteers to collect donations from families around Saigon and to correspond with the many SYSS supporters throughout the country each month. I worked in the slums of Saigon and in two pioneer villages. As a lecturer in botany at Hue University, 1,000 kilometers from Saigon, I had to fly every two months for four days of teaching and six days of bringing food and supplies to war victims in remote areas of Quang Nam, like Son Khuong and Duc Duc. Although I was doing so many things, I never felt tired. The need in Vietnam was great, and many friends shared and supported my work. I was not unique. Vietnamese and others around the world were also shouldering great responsibilities to try to help alleviate the suffering in Vietnam, but many of them became exhausted—today we call it “burnout.” I never felt that way. I continued to sing and arrange flowers in my room, trying to keep my spirit fresh and happy. One day a cedar friend who had been active for two years before getting married and having children came to visit, and she was amazed at my joyful attitude. “What kind of ‘fuel’ do you take to be so steady, faithful, and full of joy on this arduous path?” she asked. At her question, I looked back at all my work and was surprised, too, that I was able to take on so many responsibilities with ease. Only later did I realize that my fuel was living simply and practicing one Day of Mindfulness each week. I have always lived like a nun—eating simple foods, owning just a few changes of clothes, wearing no cosmetics, and having no money of my own in the bank. I even donated the diamond necklace and diamond bracelets my parents gave me to a project for the poor. From the age of twenty, I knew that someday I would shave my head and join an order of Buddhist nuns. In 1960, Thay Thanh Tu, Thay Tri Quang, and Thay Nhat Hanh all advised me to wait before being ordained, but in 1963 Thay Tri Quang encouraged me to become a nun. I asked Thay Nhat Hanh, and he said that the precepts for monks and nuns formulated 2,500 years ago needed to be renewed. He showed me fourteen new precepts he had written that he felt carried the deepest teachings of the Buddha and would be fit for our time. He said he would tell me when he thought was the best time for me to shave my head and become a nun. But for now, he invited six of us, the leaders of the SYSS, to receive the Fourteen Precepts in a formal ceremony. 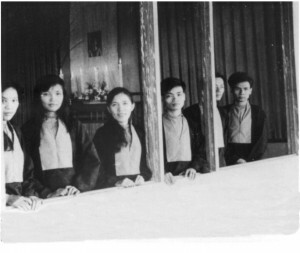 The first six members of the Order of Interbeing (left to right): Cao Ngoc Phuong, Pham Thuy Uyen, Nhat Chi Mai, Nguyen Van Phuc Do Van Khon, and Bui Van Thanh. On the fifth of February in 1966, a full moon day, Thay Nhat Hanh ordained the first six members of the Tiep Hien Order, the Order of Interbeing. This Order was created by Thay to help bring Buddhism directly into the arena of social concerns during a time when the war was escalating and the teachings of the Buddha were most sorely needed. 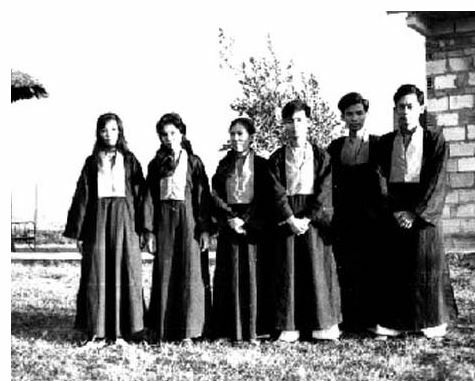 Thay proposed that the Order be composed of monks, nuns, laymen, and laywomen, and said that the six of us first ordained were free to choose whether we preferred to live and practice as formal monastics or as laypersons. We three women chose to live celibate lives like nuns, although we didn’t shave our heads, while the three men chose to marry and practice as lay Buddhists. Among the three women was Nhat Chi Mai, who immolated herself for peace just a year later. It was a wonderful celebration! Each of us was given a lamp with a handmade shade on which Thay had calligraphed “Lamp of the World,” “Lamp of the Full Moon,” “Lamp of Wisdom,” etc., in old-style Chinese. During the initiation ceremony, we six ordainees vowed to study, practice, and observe the Fourteen Precepts of the Order of Interbeing. Since that day, I have felt that these precepts are my primary teacher, especially when I have been under stress and do not know the best way to act. 4. Do not avoid contact with suffering or close your eyes before suffering. Do not lose awareness of the existence of suffering in the life of the world. Find ways to be with those who are suffering, including personal contact, images, and sound. By such means, awaken yourself and others to the reality of suffering in the world. 6. Do not maintain anger or hatred. Learn to penetrate and transform them when they are still seeds in your consciousness. As soon as they arise, turn your attention to your breath in order to see and understand the nature of your anger and hatred and the nature of the persons who have caused your anger and hatred. 14. Do not mistreat your body. Learn to handle it with respect. Preserve vital energies (sexual, breath, spirit) for the realization of the Way. Be fully aware of the responsibility of bringing new lives into the world. Meditate on the world into which you are bringing new beings. The conditions requested by Thay Nhat Hanh to those of us who formally ordained with him were to practice at least sixty Days of Mindfulness a year and to practice with a community of friends. Even though I continued to be extremely busy, I renewed myself every week with a Day of Mindfulness at our SYSS temple, from Saturday noon until Sunday noon. I would always come laden down with worries about urgent responsibilities, but after a short while I could slowly calm myself and stop even the most anxious thoughts. I tried to dwell mindfully on every act, beginning with putting my overnight bag in my room, boiling some water for washing, and putting on my meditation clothes. Then I practiced walking meditation alone in the woods, picking wildflowers and bamboo branches for arrangements for the meditation hall. After three hours of dwelling steadily in each mindful act and releasing all my worries, I began to feel renewed, and we six members of the Order gathered to recite the precepts and chant the Heart Sutra together. Then we shared tea and our experiences of the past week, ate dinner silently together, and practiced sitting meditation before bed. We meditated together again in the early morning. During individual time before and after evening meditation and the next day, I sometimes had to resume my urgent work alone in my room, but I always did it in a mindful way. One day, Nhat Chi Mai said to me, “We are such a new Order that the Buddhist Church does not accept us as nuns.” I comforted her by saying, “Don’t worry. We don’t need their acceptance. We were ordained by Thay because we wanted to follow the Fourteen Precepts. Others can think of us as laypersons, nuns, or whatever they want. What is important is that we practice the precepts as guidelines lighting our path of service and helping us transform our negative tendencies, like fanaticism, narrow-mindedness, anger, and hatred.” In fact, as we continued to practice sincerely, many of the high monks came to appreciate us. Although they didn’t call us nuns, they treated us with equal respect. Today, thousands of friends in Europe, North America, Australia, and Asia have come to know and practice these Fourteen Precepts, although most have not had the opportunity to receive them formally from Thay. I always advise those who wish to practice the precepts to organize a Sangha, a community of friends, around them, to recite the precepts every month, and share their experiences of living the precepts. If they do this, already they are members of the extended community of the Order of Interbeing12. 12 See Thich Nhat Hanh, Interbeing: Fourteen Guidelines for Engaged Buddhism (Berkeley, CA: Parallax Press, 1993).